What is Amazon Lightsail ? Amazon Lightsail is the easiest way to get started with AWS for developers who need a simple virtual private server (VPS) solution. Lightsail provides developers compute, storage, and networking capacity and capabilities to deploy and manage websites and web applications in the cloud. Lightsail includes everything you need to launch your project quickly – a virtual machine, SSD-based storage, data transfer, DNS management, and a static IP – for a low, predictable monthly price. What is a Lightsail Plan ? This was just announced today so while limited in OS and location choices right now, you can fully expect this to grow much more and likely pretty fast very soon. Certainly can be bad news for other VPS providers! Yeah depends though the lower cpu core counts on Amazon LightSail aren't as enticing. My usual criteria to measure against is Linode's 4 cpu cores at US$40/month = US$10 per cpu core per month. Guess an important part of Amazon Lightsail will be creating a static fixed IP address Lightsail for instance stop/starts. Today we are launching Amazon Lightsail. With a couple of clicks you can choose a configuration from a menu and launch a virtual machine preconfigured with SSD-based storage, DNS management, and a static IP address. You can launch your favorite operating system (Amazon Linux AMI, Ubuntu, CentOS, FreeBSD, or Debian), developer stack (LAMP, LEMP, MEAN, or Node.js), or application (Drupal, Joomla, Redmine, GitLab, and many others), with flat-rate pricing plans that start at $5 per month including a generous allowance for data transfer. so yes CentOS and Debian are planned for ! Amazon Lightsail is a direct attack to Digital Ocean, which is becoming too large. Amazon Linux is a clone of RHEL just like CentOS. But CentOS support is on its way. AWS Lightsail gives you the ease of use of VPS, but lets you easily integrate with any other AWS resources. Good luck VPS providers. Since centminmod compiles many apps from source, would it really be that hard to make it ubuntu compatible. most Yum packages are also available on debian. I don't know all the optimizations either but we can work backwards. First get the basic stack down even with precompiled packages and then work on the optimization. Unfortunately, I don't have the time to do such. CentOS is my focus with very far in future plans for Fedora and maybe Amazon Linux AMI. The focus is on CentOS though for now. You can currently create up to 20 Lightsail instances, 5 static IPs, and 3 DNS domain zones in a Lightsail account. DNS management is free within Lightsail. You can create up to 3 DNS zones and as many records as you want for each DNS zone. You also get a monthly allowance of 3 million DNS queries per month to your zones. Beyond your first 3 million queries in a month, you are charged $0.40/million DNS queries. Lightsail snapshots cost $0.05/GB-month. That means if you take a snapshot of your 30 GB SSD instance and keep it for a month, you pay $1.50 at the end of the month. When you take multiple successive snapshots of the same instance, Lightsail automatically cost-optimizes your snapshots. For each new snapshot you take, you're changed only for the part of the instance that changed. In the example above, if your instance only changes by 2 GB, your second instance snapshot costs only $0.10 per month. Not weird if you ask me. The relative little cpus, capped i/o, limit dns queries is all about to protect AWS. 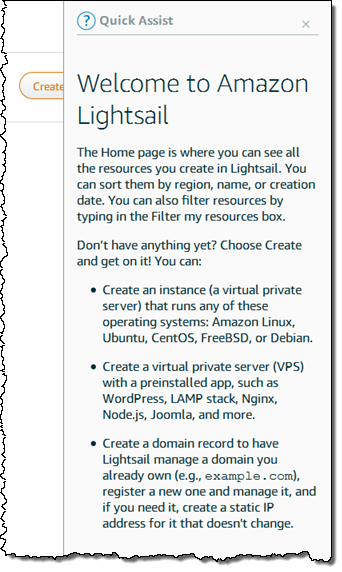 Lightsail is for light usage, to introduce yourself into the world of AWS and it's features. So you can easily migrate to AWS afterwards if you are getting big and bigger or familiar with Lightsail/AWS. Their goal is to get all costumers on AWS. There would have been no Lightsail if there was no Digitalocean. Lightsail costs them money but it is earned back with AWS, at big big margins. To sum up: It is all about stopping Digitalocean (What has become much too large) and getting new AWS customers via the Lightsail loop. Nothing more nothing less.